Putter Boy 34 oz. Bubba Keg with screenprinted logo. 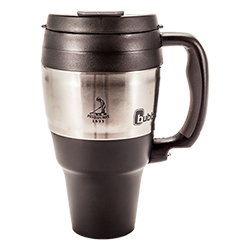 This travel mug has a tapered base, allowing it to fit into most car cup holders. It is double-walled polyurethane with foam insulation. It keeps beverages hot or cold for hours. BPA free.